In a turquoise & white building on 11th St. in Austin, Texas, sit five of the biggest, baddest, horizontal smokers ever seen. The smokers are of traditional offset design, made from 1000gal propane tanks, each with their firebox doors left ajar to draw in air for combustion. 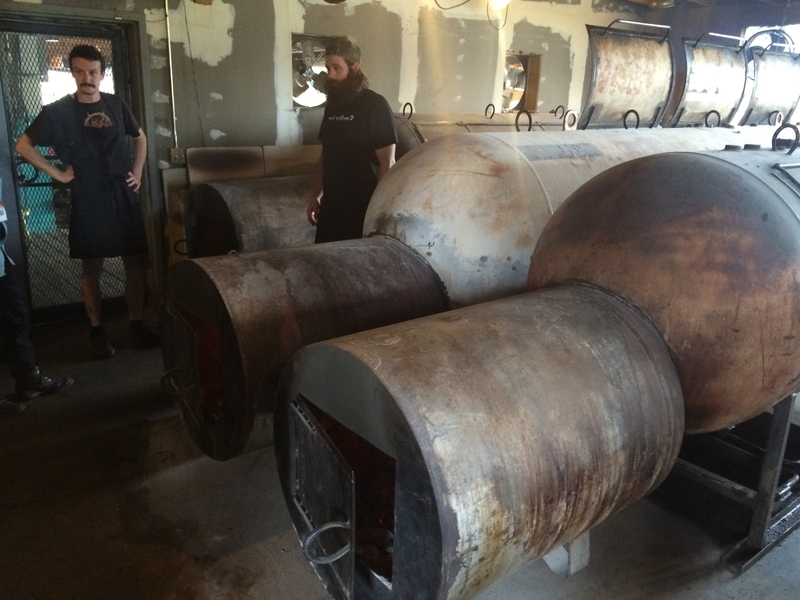 The horizontal offset smokers at Franklin BBQ are made from 1000gal propane tanks. 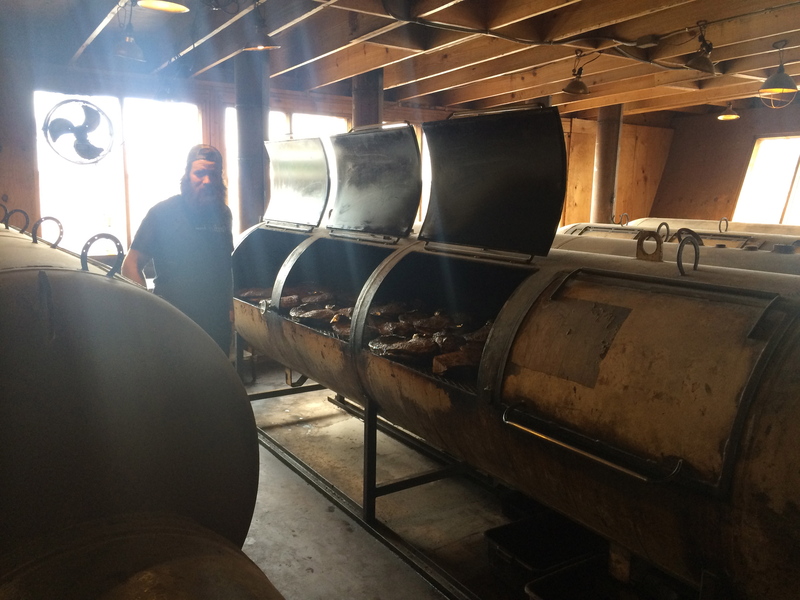 The fires burn 24 hours, 6 days a week, producing enormous quantities of smoked meats. Yet, even with all that rack space and round the clock hours, Franklin Barbecue still can’t keep up with demand from its adoring fans. Carl checks the meat on one of the five enormous smokers at Franklin Barbecue. Aaron Franklin, founder/owner/cook shared Franklin Barbecue has sold out of food every day since the early months after its opening in 2009. Crowds of people gather each morning, waiting an approximate four hours, to taste the barbecue ranked No. 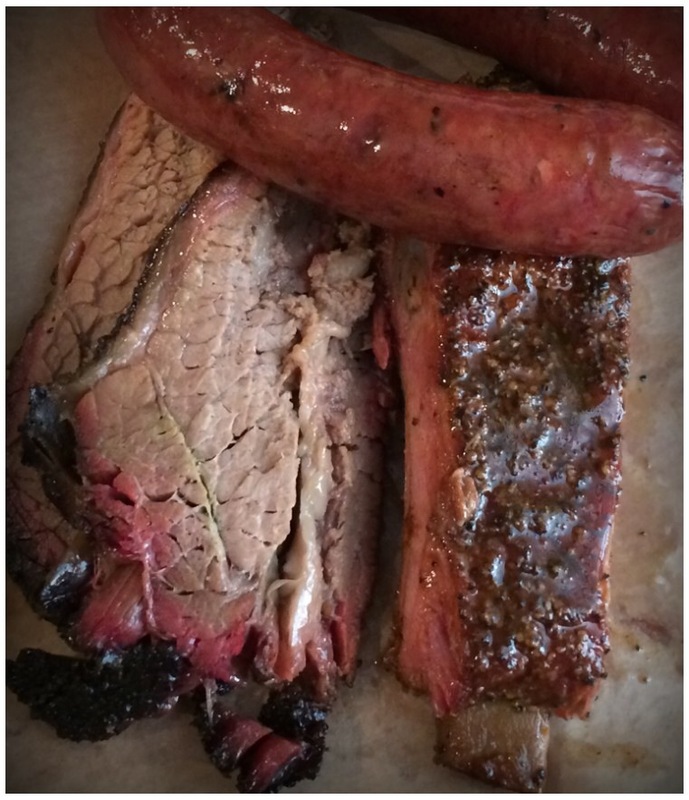 1 by both Texas Monthly (best barbecue in Texas) and Bon Apetit (best barbecue in America). With all these acclaims, Franklin Barbecue has become the big kid on the block that everyone wants to take down, which has spurred a lot of great competition. 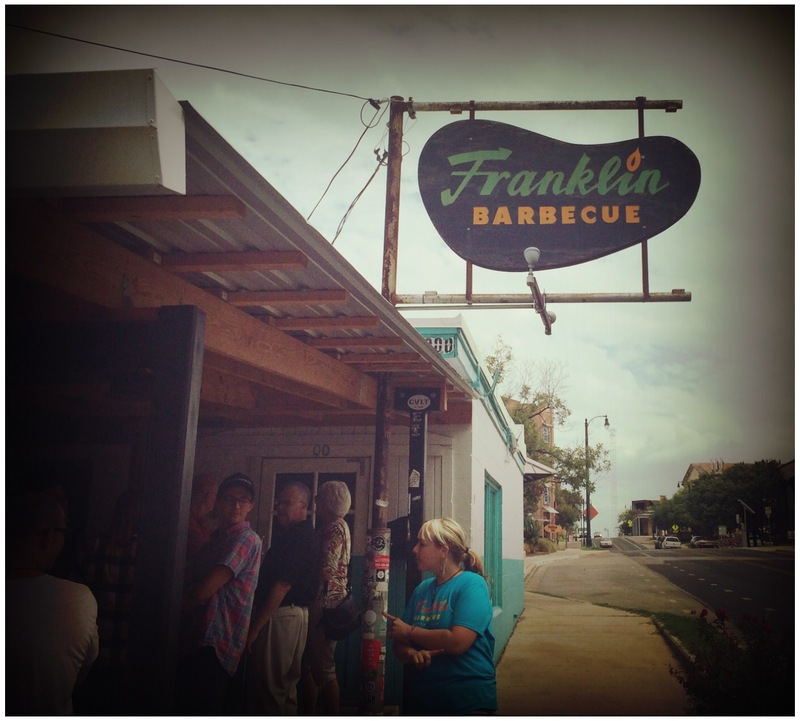 The accolades have also resulted in a lot of attention for the restaurant – everyone seems to want to know if Franklin Barbecue lives up to the hype. The constant crowds have spawned entrepreneur-minded individuals to offer chairs for rent, and others stand in line as a surrogate for those without the time themselves. 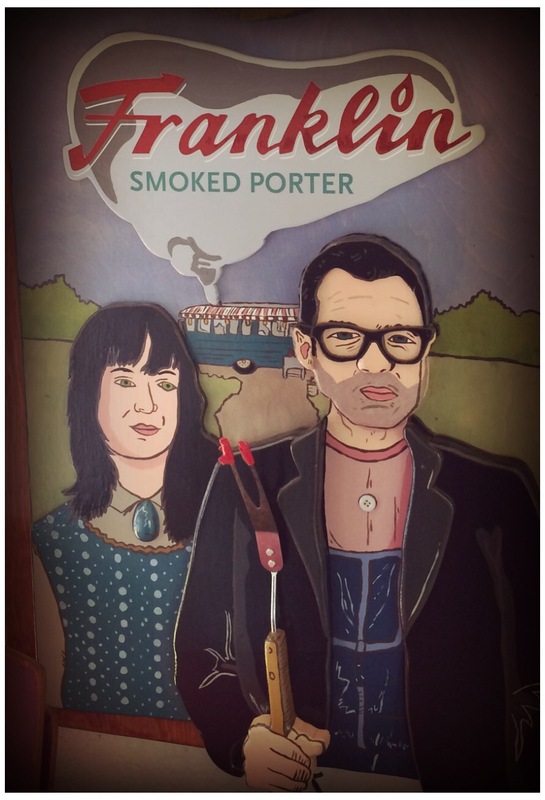 Aaron Franklin has taken his art to the masses through his YouTube channel, and now through his book, “Franklin Barbecue – A Meat Smoking Manifesto”. His ways are simple, but his results are profound. He was just recently awarded the James Beard award for best chef: southwest for 2015, which turned the food world on its head! Aaron smokes his briskets in those big, bad smokers of his for ~14 hours at 275* on the grate, with a liberal application of salt and pepper for a rub. While insiders have hinted that Franklin Barbecue uses secret ingredients and methods not published, this is the official claim. Whatever the method, Franklin Barbecue produces some of the most amazing beef brisket the author has ever tasted – a sloppy mess of deliciousness! Good luck using a fork as the brisket is so tender it just falls apart under its own weight. The entirety is extremely flavorful, not just the well-barked outside. Peppery goodness overflows from the plate, leaving you just wanting more! A nice smoke ring was present, and the complete rendering of the fat made for a beautiful piece of meat. 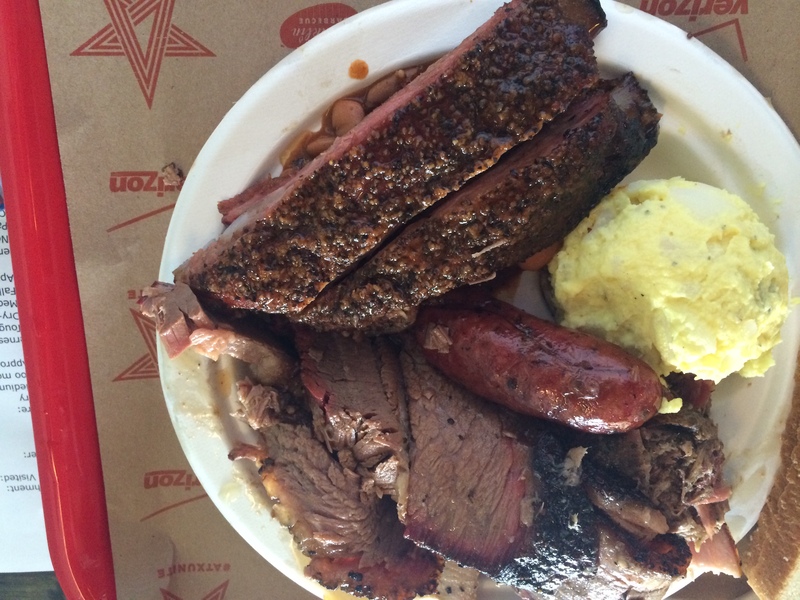 I have had similar brisket at Black’s in Lockhart, Texas, but to say I’ve had better brisket starts to get difficult. Every purveyor of smoked meats will have its good days and bad days; each batch of briskets will have its good slabs and not so good slabs; and each brisket will have its best pieces and not so best pieces. When it comes to which PIECE of brisket I have enjoyed the best, that honor goes to La Barbecue, but it is a close call. The wet bark on the ribs at Franklin Barbecue is beautiful and delicious! Definitely a ‘wet’ rib, sloppy with juicy goodness that barely clings to the bone just long enough to be slowly lifted to your mouth before falling off. Simply amazing, and completely tender. If you prefer a drier rib, this might not be your perfect rib, but if juicy rib meat falling off the bone is your idea of heaven, bon apetit! 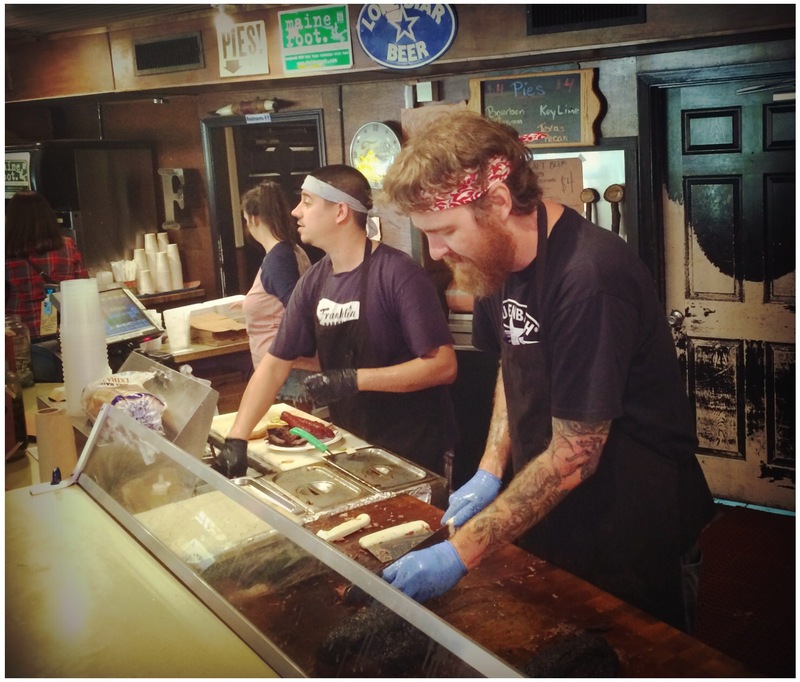 Coarse-packed with plenty of traditional sausage flavor, Franklin Barbecue serves a fantastic sausage that will never be mistaken for store-bought. While it may not be the best sausage you’ll ever eat, it will probably be the best you ate that you can recall! I hope each of you get to experience the very best that Franklin Barbecue has to offer, and if you don’t think it is the best barbecue you’ve ever eaten, go back for a second taste! Every experience is unique, and every plate a work of art, so ENJOY! This entry was tagged Aaron Franklin, Austin Barbecue, Bar-B-Que, barbecue, beef brisket, Franklin Barbecue, Franklin BBQ, pork ribs. Bookmark the permalink.